Awe Fredrick Oluwatimilehin from Physics Electronics Department got CGPA 4.83 to emerging the best graduating student for 2015/2016 academic session of Adekunle Ajasin University (AAUA). 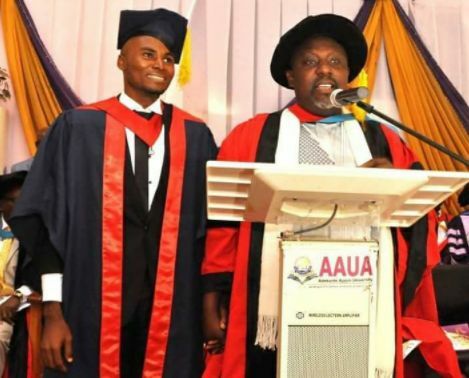 In an emotion laden address to thank the audience on behalf of other graduands, Awe narrated how he was kidnapped by ritualists for three days; how his father abandoned him and other siblings for over twenty years but inspite of all that he was determined to make it. He eventually made it! 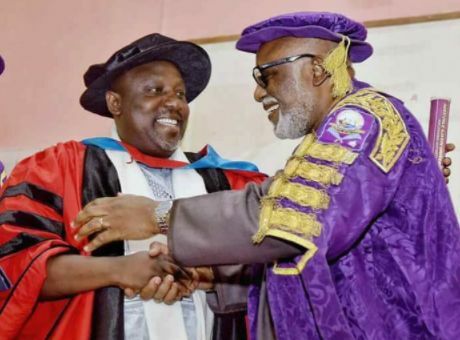 Governor Rochas Okorocha, who was honoured with a Honorary Degree of Doctor Of Letters, was impressed by the story of Mr Awe. He rose and said I would have like to take you out for lunch but for my time, however please kindly accept N500,000 for your lunch. "Stand with me. I love to identify with greatness. Blessed is the womb of your mother," he said. Immediately, the Governor brought out N500,000 cash and handed it over to Awe Fredrick and the audience rose in ecstasy, smiling, shouting and some shielding tears of joy.